are growing in population. in 2009, the marina reported a growth of around 2 or 3 to 12 in number. in 2011, just prior to the annual breeding season, there were about 35 sea lions hanging out in the marina. Last summer there were 220 male California Sea Lions counted on the Westport Marina Docks. SEA LION ON FLOAT #6 TAKING ADVANTAGE OF ROCKFISH CARCASSES DISCARDED IN WATER. 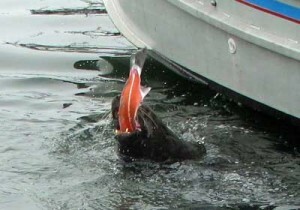 the issue of the growing sea lion numbers is not about bad sea lions or bad humans, but the negative impacts of when hungry sea lions and hungry humans, looking for fish and crab, interact when they probably shouldn't. PLEASE DON'T FEED THE SEA LIONS! MUCH LIKE OURSELVES HERE AT THE AQUARIUM, WHEN SEA LIONS KNOW THAT FOOD IS PLENTIFUL, THEY WILL COME BACK WITH THEIR FRIENDS AND DEMAND IT. 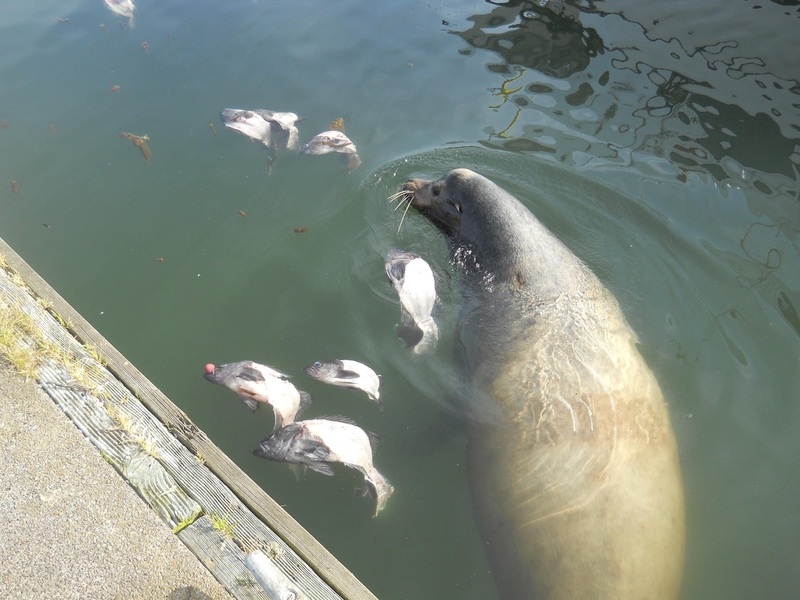 IN PAST YEARS THE AQUARIUM HAS RESPONDED TO REPORTS OF SEA LIONS JUMPING ON THE DOCK, CHASING DOGS AND PEOPLE WITH CRAB POTS AFTER THEY HAVE BEEN TEMPTED WITH FREE FOOD. feeding marina mammals is illegal. 16 U.S.CODE, SECTION PROVIDES FOR ISSUANCE OF FINES OF $20,000 FOR VIOLATIONS. PROVIDED THE ABOVE PHOTO. CHECK OUT THE LINK WITH THE STORY. READ ON.... WITH WWW BLOG POSTS. 5/7/12. report of sea lion jumping on dock at float #5 and taking crab bait from a man while he was loading the baitbox of his crab trap. visited site and spotted folks filleting halibut on a table on the dock while a sea lion waited in the water for scraps. 5/16/12. report of of of three sea lions on float #7 blocking the main dock. reporting party tried to get around the sea lion and was chased down the dock for approximately 50'-75'. reporting party left immediately. SPRING 2012. REPORT OF SEA LION ATTEMPTING TO BOARD BOAT AT FUEL DOCK TO GET TO FISH ON DECK. 6/10/12. 70 year old man gets in to tug of war with his crab pot with a sea lion on float #20. sea lion finally let go when the lion was able to retrieve the bait from the pot. the man's two carbbing companions already had their crab pots raided previously. ON DOCK. TURNS AROUND TO FIND SEA LION ON FLOAT BLOCKING WAY. SOME OTHER GUY IS HANDING FISH PARTS TO HIS KIDS..
**** OLDER COUPLE ARE ON FLOAT 20 IN CHAIRS, WAITING TO CHECK THEIR CRAB POTS. AND GRABS DOG. DOG NOT RECOVERED.